Provincial Nominee Programs (PNPs) of Canada play a significant role in Canada immigration every year. With an increased nomination allocation quota in last few month, PNPs are having a telling effect on Economic immigration programs of Canada. Although PNPs play a role of second fiddle to Federal Express Entry System, however, in last 12 months or so, they have really started making their presence felt. With Express Entry System cut off marks are not reducing by much in in last one year or so, Provincial Nominee Programs have come out to rescue of the candidates with low CRS score. Let’s find out the top PNPs to apply in 2019. Ontario PNP with its increased annual nomination target this year will be a key provincial nominee program to apply. Moreover, it has now become the preferred choice of the immigrants with low CRS score due to its recent announced about minimum CRS score requirement. Ontario has recently revealed that it is no longer having minimum CRS requirement of 400 points for its Express Entry Stream, rather it will be decided by the OINP director only for each draw of OINP. Since then it has even accepted the applicants with CRS score as low as 350 CRS points. However, such applicants need to have some experience in priorities ICT occupation or proficiency in French language, etc. 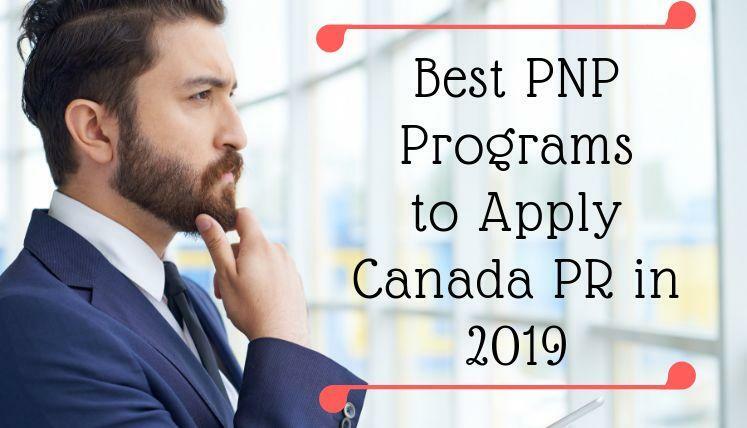 Saskatchewan PNP is a crucial Provincial Nominee Program with its popular streams, i.e. Express Entry Subcategory and Occupation in Demand (OID) Subcategory. SINP has become more organized and popular with its new Expression of Interest (EOI) based system, as now the applicants get enough time to register their profile and then wait for the outcome in the form of Invitation to apply for provincial nomination. The best thing about applying in SINP is you don’t need any job offer from Canada, moreover, the OID subcategory accepts the applicants with limited language proficiency, i.e. as low as CLB 4. Nova Scotia accepted 2,272 candidates in the year 2018 and it is going to be a telling Provincial Nominee Program this year as well. Nova Scotia Demand Express Entry Stream (Category B) is largely popular among the Canadian PR aspirants with no job offer requirement. Last year, EE stream alone accepted 1400 applications. Hence, NSNP- Express Entry stream is going to be a vital Canada PR pathway in 2019. With its Expression of Interest (EOI) system in place, Manitoba Provincial Nominee Program (MPNP)is going to be an in demand PNP in the year 2019.So, be ready with your immigration file to apply in the upcoming intake of MPNP in the year 2019. Among other PNPs, you may also think of applying in AINP, BCPNP, PEIPNP, etc. These are also good programs to obtain provincial nomination and subsequently, the Canada PR in the year 2019 based on your profile. To apply Canada PR in 2019 through most appropriate immigration program, you may get in touch with vastly experienced immigration and via professionals at Visas Avenue Immigration. You may call Visas Avenue migration experts on Toll Free Number- 78-18-000-777. Moreover, to get your eligibility checked and subsequently, receive a call from the expert, you may fill the free assessment form. How low minimum CRS score Expected to Drop in 2019?